The legal battle escalates over the government's ability to spy on internet and phone traffic. This is a special room. I'm -- -- -- -- with a CBC news digital special report for the first time since Edwards -- began leaking information about the NSA's massive secret spy program. A federal court has called the government's actions unconstitutional. But the debate is far from over in a court battle. It's only just begun with more wanna go outside of the White House where ABC's papers is standing by in Washington area. -- and that's -- a federal judge is now questioning the legality of these massive NSA programs to gather data on almost all of American's phone records. And email setting up a much broader face -- over spying in America. A big blow to the Obama administration's massive and controversial collection of americans' phone records a federal judge -- the national security agency's database of virtually all phone calls in the US. May be unconstitutional. US district judge Richard Leon that George W. Bush appointee said the program almost certainly does violate a reasonable expectation of privacy. 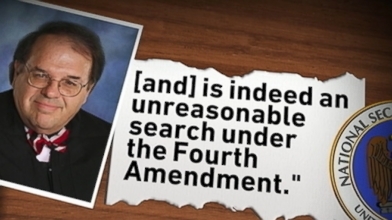 And is in -- and unreasonable search under the Fourth Amendment. The almost orwellian technology used by the NSA judge Leon said. Enables the government to store and analyze the phone meta data of every telephone user in the United States. The ruling which -- being hailed by liberals as well as some conservatives sets up a high stakes battle over security and spying -- America. That's expected to be decided by the Supreme Court. -- federal judges finally pushed -- back. Is finally saying to the -- say no in fact -- collection of phone records without individualized suspicion is not legal. It's a victory for infamous and SA leaker -- Snowden who revealed this summer just how much phone data the NSA is gathering. The president has said this program and another the track emails are key to the fight against terror we save lives. We know of at least. Fifty threats. That have been averted because of this information. But judge Leon refuted that argument saying there is no evidence the program has thwarted a terrorist attack. For now the program continues pending the government almost certain appeal the Justice Department has said it's reviewing the court's decision stands so -- let me ask you about that and how. Quickly that adds is that it you'll have to be form which the federal government forgiven for a timeline. So despite the judge's dramatic language they're now is about. A six month period in which the federal government can appeal and we certainly expect that will happen so now that the ball is rolling expect the government to go ahead and take some action so what is the White House doing that it is there any kind of a change in stance or position on this of being behind the NSA. The White House has not commented directly yet on this ruling saying only that -- the Justice Department is reviewing the court's decision. But as you heard from the president's own mouth there the bill White House really. Backs these programs the president has said that there is of course a balance here that needs to be struck between the need to protect. Americans' privacy but also need to protect American security so while they're willing to look into these programs to maybe make some tweaks to them they do support the Tennessee's over -- here. Certainly -- -- was going to be watching for ABC's papers outside the White House Mary thank you for that. For more on what this means for the tech companies so intricately involved. In these spy tactics -- want to bring in Greg -- instinct writer for techcrunch Greg thanks for being with they were appreciated. And charming -- so these tech leaders are gathered at the White House today in fact and they obviously we'll be talking about the spy programs with the president. Where -- companies like Google faced look where they stand in this fight. So they've gotten increasingly aggressive against the NSA over the last few months. -- called for the end of all collection that is currently in -- buying. Internet behavior and telephone call records. I'm Dave also called for the ability to disclose the number of users that are queried by the national security. Its interest in this on some very strong words I was from the judge yesterday in the ruling right in fact as we heard from -- -- -- quote almost orwellian technology that enables the government sort analyzed. -- metadata on every telephone -- in the United States is unlike any in the could've been conceived in 1979. Why sitting -- significant. Well because it it was a court case that. That the US government now users to legally justify all the activities that is right. I mean he's saying that technology -- all the allow the government to maintain and searched more information and the ever could have imagined. So long EBR. So I mean obviously that same income from the -- today but this case still has a long way to go so what are some of the more significant hurdles that it has declared before potential argument. 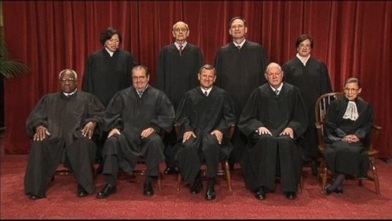 Is made of the Supreme Court if it is there. Oh yeah there's a lot of celebration yesterday but it was Cortese is mostly symbolic -- -- The media injunction that that is trying to stop the NSA from collecting this data is stayed until the appeals court a higher court makes its ruling and likely. I'm one of the many cases from the -- and -- civil libertarian organizations that are. Taking issue with the NSA eventually they're gonna have to go to the Supreme Court so it's all -- -- for probably the highest court of the language and that may take so long should that congress or the president himself could reform program floor. Greg wanted to ask you then -- -- about this that the president in fact. Was tasking a panel of senior government intelligence officers from past and present to review the programs possibly recommend some changes do we know if that group. -- you know deliver that report. So. So the Wall Street Journal -- that the task has delivered -- -- the most significant change that they're reportedly calling for is to make a civilian in charge of the NSA. Now whether they won't call the end of the controversial part of a program them all collection we don't know there's a lot of speculation but. Again we just don't. Now what about the possibility that this could be settled outside -- a courtroom in fact altogether -- the president perhaps. Accepting these these these certain reforms. -- -- pretty good chance. Right now there is increasing support in congress there's a number. Groups but in the senate and congress that have. That are proposed similar bills. Most of which call pretty and double collection the only each team is one that I'm aware that doesn't call the -- -- -- collection is the one from. Dianne Feinstein and so there's pretty strong support. And it -- You know what we see how Google FaceBook and how's the tech companies are dealing with this but what about the Telecom companies Verizon AT&T how they react to this ruling. They have been much much more muted. No one completely knows why you can speculated exhibited in certain amount of money -- to search the records maybe because they don't -- as much maybe because they have. Closer relationship -- the national security apparatus. Or what ever the reason people can come up where they are not fighting at what companies are. If in fact these NSA actions are eventually -- to be unconstitutional. As the case -- completely fallout. Could these companies and face lawsuits from private citizens. Cash you know. That's a lot more complicated because is generally that government has granted immunity from these types of activities back. Back during that the bush era when it was found out it AT&T was collecting. A lot of data and -- -- a secret closet warehouse. -- in in San Francisco's soma district. AT&T was eventually not held liable -- so I think if you look at historical precedent. Probably not because he was granted with the government's mission age and up until now it's -- an entirely legal. The man that is obviously associated with this Edwards noted had a reaction. To the ruling asking Brazil in fact. For political asylum so he continued to fight NSA activities and this is what he wrote the tide. Has turned and we can finally see a future where we can enjoy security without sacrifice their privacy rights cannot be limited by secret organization. And American officials should never decide the freedoms of Brazilian citizens. Is there any indication that the Brazilians will accept that offer for a -- We don't know I mean it's a diplomatically it's -- very -- -- I mean look I lived in Brazil three months I can't blame him for wanting to move their especially Russia. It's. It's oops I mean it. Russia has a much more tenuous relationship with the United States and they can do this at a symbolic move against the United States Brazil wants to how much friendly relationship. Is a pretty bold move. -- to take an enemy of the United States and and how it was him while he investigates. Secretly government programs. It is a diplomatic tango I suppose great -- -- and from techcrunch Greg thank you so much we certainly appreciate that. Of course have a complete recap right here on ABC news dot conference on down tougher New York with this ABC news digital special report. White House says it will review decision against NSA program that collects data on phone calls. Federal judge ruled that NSA storage of phone metadata almost certainly violates the 4th Amendment. 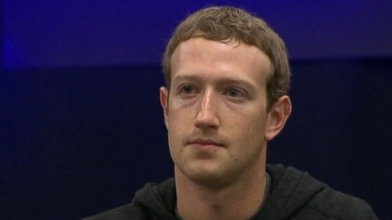 Facebook CEO and FWD.us founder Mark Zuckerberg on immigration, NSA spying, and HealthCare.gov.